REAL ESTATE AUCTION!! Large 2-story home built in the late 1800âs. This home is approximately 2,500 sq. ft above grade living space. There are still a lot of original features found in this home such as the intricate wood work, pocket doors and built-ins. The home is situated on a large 4.7 acre lot and also offers a detached garage and shed. Terms and conditions apply, ask your real estate agent for more info. 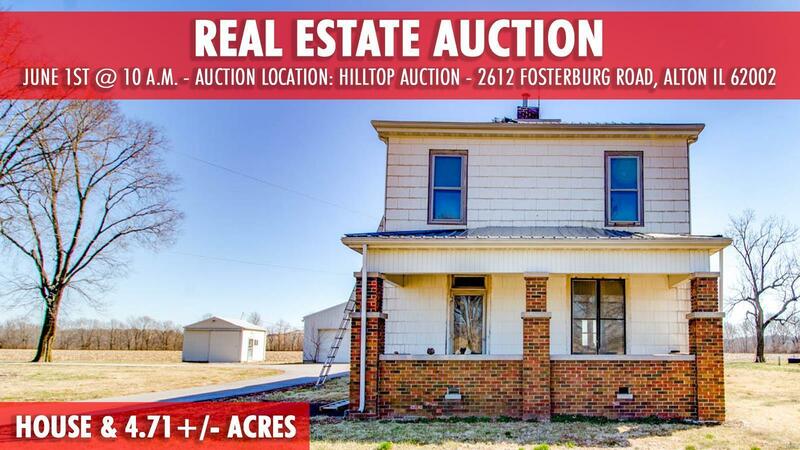 BIDDING WILL TAKE PLACE IN A LIVE OFF-SITE AUCTION JUNE 1ST, 2019 @ 10 AM AT HILLTOP AUCTION & BANQUET CENTER - 2612 FOSTERBURG RD. ALTON, IL 62002. Buyer and buyer agents to verify all information.